Lollipops are an old-fashioned favorite, and, sure, it's easy to buy them in the store, but it is even more fun to make them at home. 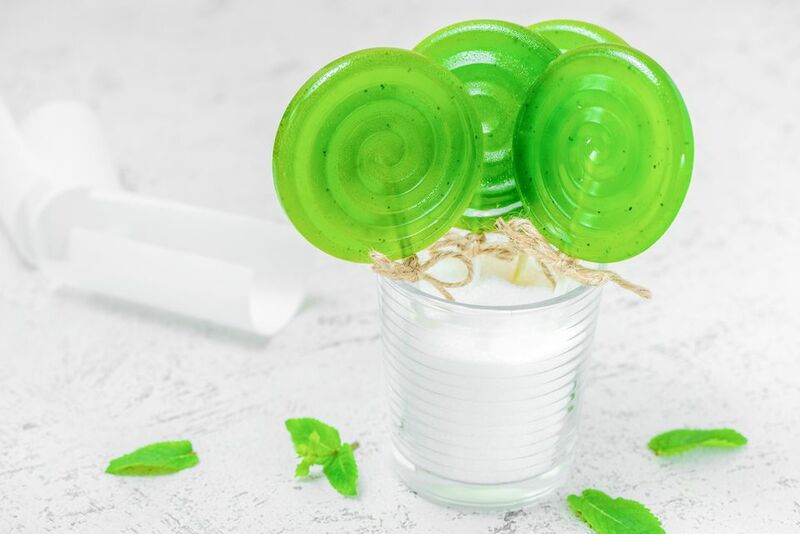 The best part about making your own lollipops is that you can completely customize them—choose your favorite flavorings and create combinations that appeal to you and your family and friends. Coconut-lime? You got it! Spicy Pineapple Mint? Sounds delicious! Once you master the basic recipe, you'll love crafting new combos and experimenting with your own lollipops. You do need a few pieces of inexpensive equipment to start, such as a candy thermometer and a lollipop mold, both of which can be found for a few dollars at cake and candy supply stores, many craft stores, or online. You'll also want lollipop sticks, flavoring extracts (it could be simple vanilla or a variety of exotic flavors), and perhaps food coloring. Prepare your lollipop molds by spraying them lightly with nonstick cooking spray. Wipe out the inside with a paper towel, so that only the thinnest layer of oil remains. Insert the lollipop sticks into the molds. Combine the sugar, corn syrup, and water in a medium saucepan over medium-high heat. Once boiling, insert a candy thermometer. Allow mixture to boil, without stirring, until candy reaches 300 F (149 C). This is called the hard-crack stage. Remove saucepan from heat. Allow it to sit until it stops bubbling completely. Stir in the extract of your choice, and, if desired, food coloring. Make sure to have all of your equipment on hand before tackling this recipe. In addition to the molds and sticks, you will need a straight-sided saucepan with a heavy bottom, a wooden spoon with a long handle, and a pastry brush. Save yourself some hassle (as well as possible skin burns) by using a candy thermometer with a clamp that secures it to the side of the saucepan. Since sugar attracts water, the weather can have an effect on candy making. Humidity can ruin an otherwise perfectly good lollipop by making it nearly impossible to reach the hard-crack stage. So, even though a rainy day is perfect for a kitchen project, it is not ideal for this one. Vary the flavor of the lollipops by changing out the type of extracts you use. And feel free to try out interesting flavor combinations, but be sure to taste the mixture before you make a whole batch. You can also alter the colors, matching them to the flavors so they are easy to decipher from each other. Cinnamon pairs well with red food coloring, vanilla pops can be yellow, and mint pops look good in green. If you like the lollipop-making process, try other candy recipes like salted caramels and cinnamon hearts. If you have never made candy, it is important to understand the stages of candy making before you start. There are six stages: thread, soft ball, firm ball, hard ball, soft crack, and hard crack, and each stage happens at a different temperature. Thus, using a candy thermometer is crucial (and if you have owned the candy thermometer for some time, you should test it to make sure it is still accurate). You can also do a test by dropping a spoonful of the syrup into a bowl of cold water—if it has reached the hard-crack stage it will form brittle threads in the water and crack once you remove and try to bend it.